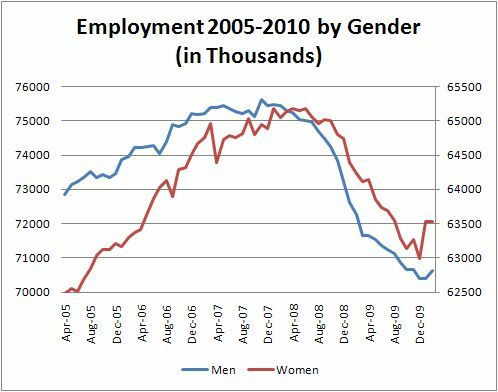 Who Has Lost More Jobs – Men or Women? The U.S. labor market report was released this morning and the data was much better than everyone had anticipated. Following the warning from Larry Summers that the storms in the Northeast could have swelled unemployment rolls, investors were bracing for the worst. However disaster was averted and Larry Summers will probably not be forecasting payrolls again anytime soon having embarrassingly caused a stir in the financial markets (but then again Summers is never one to be embarrassed easily). As I wrote yesterday, Summers did not have the NFP report on hand when he gave the warning which was clearly the case as payrolls fell a mere 36k. There has been alot of analysis published on the NFP number including including ours on FX360.com. One thing that I do want to point out is that the blizzards took away slightly more than a million jobs which means that next month’s report should reveal a big jump in job growth. 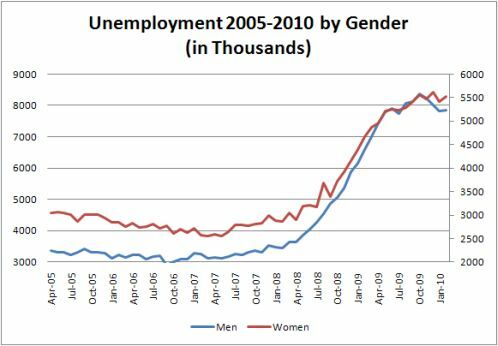 Instead I thought it would be interesting to look at where the levels of employment and unemployment are for men and women. This data, calculated from the Bureau of Labor Statistic’s information is based upon the seasonally adjustment numbers for men and women over the age of 20. There are more men than women in the labor force but we have two scales on our charts to make the comparison between the rate of change easier. The U.S. recession began in December 2007 and the number of employed men have fallen by 6 percent while the number of employed women have fallen by 2 percent since then. The level of unemployment amongst men has risen by 123 percent while unemployment for women have risen by 85 percent. ← What Does Larry Summers Know About Payrolls?